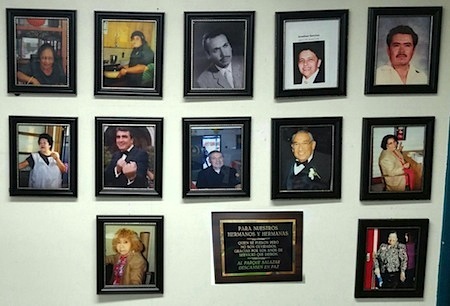 Sandra Muñoz has put off getting a green card for decades, always assuming she had plenty of time. But with less than seven weeks until President-elect Donald Trump is sworn-in to office, the East Los Angeles resident is now rushing to learn how to change her status. Like many others in her position, Muñoz is worried Trump will make good on his campaign promise to deport millions of immigrants in the country without legal status, so last week she attended an information session at Ruben Salazar Park in hopes of getting advise on how to best protect herself. The first thing to do is stay calm, advised immigrations lawyers brought in to answer questions and to help with the citizenship process. Trump’s election has cast a cloud of worry, stress and uncertainty over the undocumented immigrant community. They and their loved ones are living in fear of separation if immigration laws and enforcement tightens under the new Republican president. Nora Phillips, an attorney with Phillips & Urias, LLP in East Los Angeles has been specializing in immigration law for nearly 10 years, but acknowledges that immigration attorneys do not know what will happen once Trump steps into office but believes there is still hope, especially in California where elected officials have sworn to protect the undocumented. Phillips points out that many people who could qualify for legal residency under current immigration laws haven’t applied and urges they waste no time getting the process started. 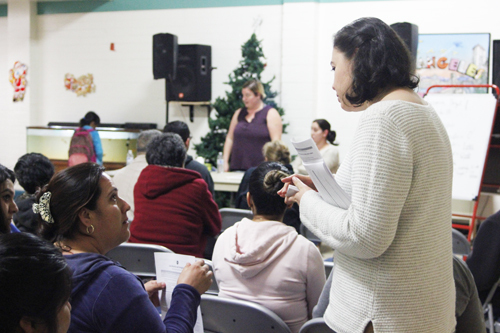 A person may be eligible for a Green Card – or permanent residency status – through a family member, their job, asylum or other petitions, it was explained at the forum. Parents of a U.S. citizen 21 and over, the spouse of a U.S. citizen and unmarried children under 21 of a U.S. citizen are given the highest priority for visas. Those who don’t qualify under one of those categories can still apply, but must wait until one of the allocated visas from their home country becomes available, which could take years. Still, even when a person is eligible, the process isn’t always smooth and can drag on. Just ask Martha Galaviz of East Los Angeles who asked attorneys why the green card petition she submitted on behalf of her brother 10 years ago has still not been approved. Phillips quickly pointed out that every case is different and the length of the process can vary from a few months to decades. She advises anyone who wants to fix his or her immigration status to at least set up a consultation with an immigration attorney before the presidential inauguration on Jan. 20. Muñoz, however, is not as confident. She told EGP finding an attorney she could trust has been a challenge, especially with all the notarios or notaries trying to pass as immigration consultants, but have been known to scam people unfamiliar with the immigration process. One of the biggest scams perpetrated by unlicensed notarios is the promise to provide a work permit but then failing to fill out the proper, required documents. In fact, many people have been duped into filling out applications for asylum, only to land up in court facing deportation, Phillips warned. But it’s not only those without legal status who are worried. Many of the people who signed up for DACA (Deferred Action for Childhood Arrivals) — an executive order issued by President Obama in 2012 that has since granted three-quarters of a million undocumented immigrants relief from deportation — are also feeling uneasy since the election. As part of the DACA process, applicants were required to provide immigration authorities with information about where they live, work, or go to school, and in some cases, about other relatives who may also be undocumented. Deportation is an undocumented immigrants’ worst nightmare and Phillips says those who have been deported before or been arrested even for minor offenses are at greatest risk for deportation under a Trump presidency. Yet, even with a deportation on their record, some undocumented immigrants may still be eligible for legal residency. As Phillips puts it, immigration laws are tough but complicated, and whether a person can stay in the country legally could come down to when the offense on their record took place. Phillips told EGP that frantic calls from potential clients have increased dramatically since the election and their staff has been busy trying to reassure callers that Homeland Security will not be snatching people off the streets. 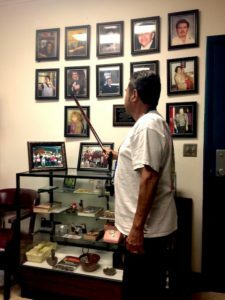 Monsignor John Moretta of Resurrection Church in Boyle Heights is a long time community and immigration rights advocate. Resurrection is not far from Salazar Park, and large numbers of Church parishioners are undocumented, leading Moretta to hope the meeting would be packed, but attendance was small. “This room should be full because, as you know, it affects almost the entire community,” he said in disappointment. Commemorations this coming weekend of the 1970 Chicano Moratorium will include a variety of speakers, several of them African American, at a march and rally in East Los Angeles on Saturday. 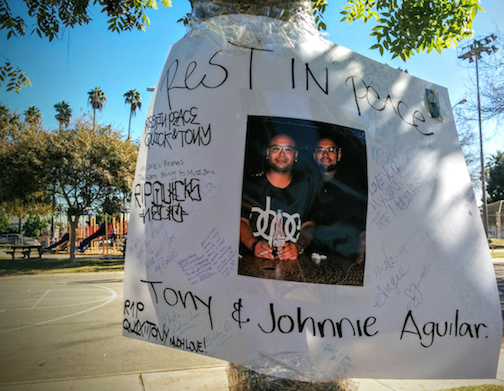 At a separate event on Sunday, guest speakers will include the parents of two people killed by police this year. The 46th Annual National Chicano Moratorium commemorates what many have come to call the coming of age of the Chicano civil rights movement. Special attention each year is paid to remembering the death of crusading Chicano Journalist Ruben Salazar by a tear gas canister lobbed into the Silver Dollar Bar by an L.A. County Sheriff’s deputy during a riot that broke out following what at that time was the largest ever protest by Chicanos – Mexican Americans in Los Angeles. The two days of activities will kickoff Saturday at 9 a.m. with a march from Atlantic Park (570 S. Atlantic Blvd. East LA) Saturday to Ruben Salazar Park (3864 Whittier Blvd., and Ditman Ave.) where a rally will be held at 12:30 p.m.
Rally speakers and entertainment will include: Kwazi Nkrumah of the Martin Luther King Jr Coalition; Allegra Casimir Taylor, daughter of a Black Panther Party political prisoner, incarcerated for 51 years before being murdered in prison last year; Hugo “Yogi Bear” Pinnell who will discuss her father’s case and the ongoing events since his murder; Wayne Arroyo, longtime American Indian Movement (AIM) activist speaking about ongoing protests in North Dakota against the Dakota Access Pipeline; Kiko Salazar speaking on long time Chicano political prisoner Ramsey Muniz; Gina Felix Goldman, actress and niece of the late Mexican movie star Maria Felix, will represent the Bring Hollywood Home Foundation on racism in Hollywood; Roberto Tijerina, internet radio talk show host from UC Riverside; David Rico, Commander of the National Brown Berets de Aztlan and Krisna Velasco of the Ritchie Valens Foundation who is producing a documentary on the life or Ruben Salazar, among several others. Jan B. Tucker of the California League of Latinos And Chicanos (CALLAC) will speak on immigration and the Treaty of Guadalupe Hidalgo. On Sunday, Aug. 29, community activists will hold a “Liberation Day Program for Chicano Moratorium” from 6 to 8:30 p.m. at Saint Mary’s Church Hall: 407 South Chicago St., L.A. 90033. The event will include a short film and Vietnam veteran Ray Andrade and former LAUSD Board Member Victoria Castro speaking on the history of the Chicano Moratorium on Aug. 29, 1970. Also speaking are Estela Rodriguez, mother of Edwin Rodriguez who was killed by ELA Sheriffs on Feb.14 and Juan Mendez, the father of Jose Mendez who was killed by an LAPD officer on Feb. 6 of this year. The setting was casual, from the coffee and Mexican bread on the table, to the prayer recited in both English and Spanish to get the meeting started. 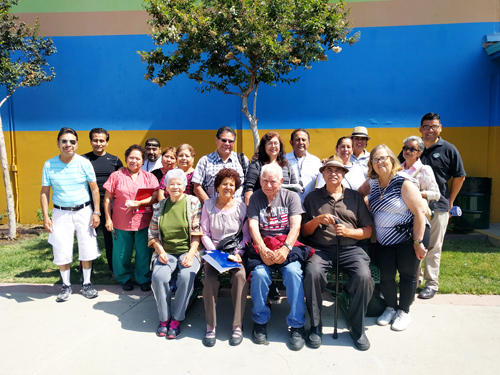 The men and women, most of them elderly, Latino and low-income, had gathered July 7 at the Ruben Salazar Park Senior Center in East Los Angeles to share their life experiences. It was the first official meeting of the “Angels Support Group,” a volunteer effort to help seniors dealing with depression, loneliness and isolation. It’s a form of group therapy among friends, is how one person described the meeting. Shy at first, one by one, speaking mostly in Spanish, they shared their personal stories of pain. Participants were told they could talk about anything and for many that meant digging into long time feelings of grief. For others, it was a chance to help someone by sharing ways to cope and move past the pain. 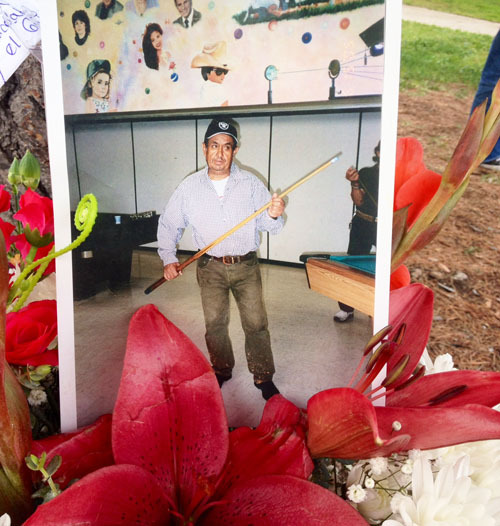 “My daughter died 11 years ago and I still cry over her death,” said Rosa Perez. For years, I cried over my mother’s death, then one day she appeared to me in a dream and told me not to suffer anymore, shared Manuela Tlatenchi. “Tears don’t allow the dead to rest in peace,” she reflected. “I felt depressed until I started volunteering and giving back to my community,” said Marcelo Vazquez, a volunteer instructor at the park. Chris Mojica just celebrated his 85th birthday. He’s a long time senior center volunteer and co-leader of the Angels Support Group and says he personally knows of at least 20 seniors who died at home alone. “They are elders who have family, but at the same time they [are all alone] because they don’t visit each other,” he said. The seniors “feel really sad and they stay home waiting to die,” he lamented. According to the California Department of Aging (CDA), California has one of the fastest growing populations in the country. Los Angeles County’s elder population is nearly 1,190,000, according to the CDA. Of those, about 718,000 are minorities and 188,000 live alone. By 2020, it’s estimated that 14% of the country’s seniors (60 and older) will live in California. 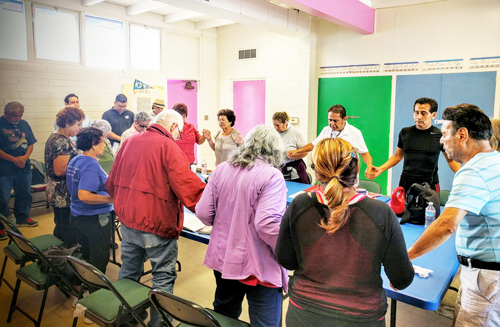 Seeking mental health services or grief counseling is rare for elderly Latinos. The idea for the senior support group came from talking to so many older people at the center who seemed depressed or were very sick, said Mojica. Depression is a problem that needs to be addressed with love and compassion, adds Ray Guerrero, another long time volunteer and group co-leader. “Laughing out loud is great therapy,” he pointed out. 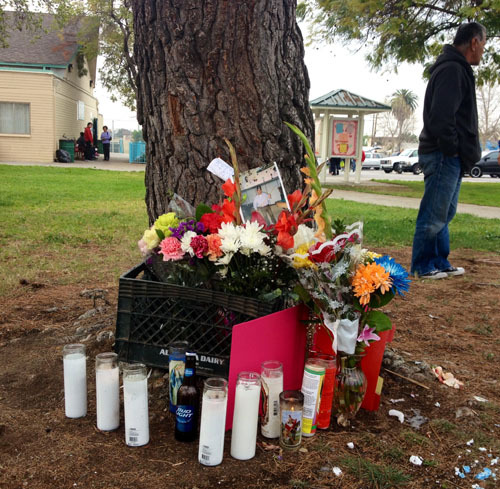 The group plans to meet Thursday mornings at Salazar Park. About 20 people attended the first gathering last week. As part of the “group therapy,” seniors are encouraged to get out more and take part in recreational activities with other members. It doesn’t matter if they choose to take a knitting class, work in one of the gardens outside the senior center, learn to play guitar or just socialize with their fellow elders, because the goal is just to keep the seniors busy. An important component of the new group is keeping track of one another when away from the center. They’ve formed a phone tree of sorts, and members are encouraged to call other members regularly to see how they are doing. The group will also visit or send cards to seniors who wind up in the hospital or a convalescent home. A $5 monthly donation—not required but suggested—will help pay for outings to museums, the zoo and the movies. Every month the group will celebrate the birthdays taking place that month, said Mojica, adding that they rely on volunteers and donations to make things happen. As with many new groups, the Angels Support Group must still overcome a number of management issues, such as keeping track of donations and planning field trips. 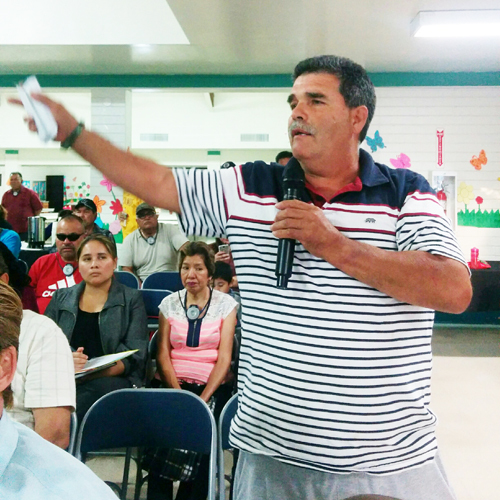 Our plans are big, but the need is bigger than what we can do on our own, said 71-year-old Guerrero. “We have the ideas, but we don’t have the strength” or know how to carry some of the ideas through, Guerrero said. “We need help from [younger] volunteers and we need donations from people and from our (elected) representatives,” he added. Participants at the first Angels Support Group meeting said they are excited about the new venture and hope more people will start attending. “Not everybody feels comfortable with the group and they don’t [yet] feel the need to be part of it,” explained Guerrero. “But it is always good to laugh and talk to other people because we tend to feel alone sometimes,” he noted. The blood-screening program, offered to east and southeast Los Angeles area residents who live near Exide’s battery recycling plant in Vernon, was to end Jan. 31, but County officials said Wednesday they will extend the program until the end of February. 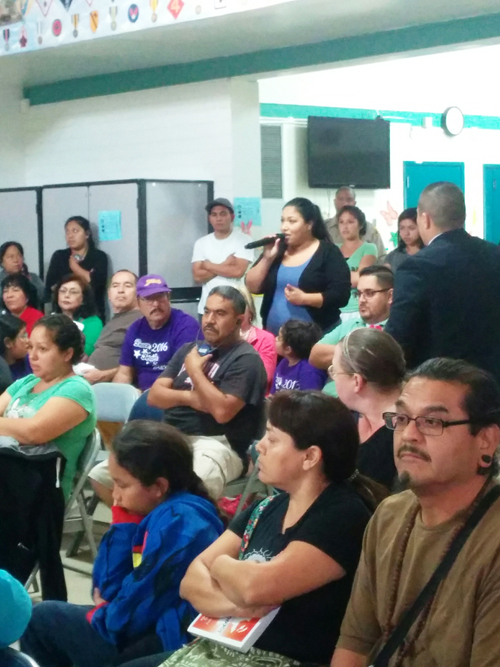 The administration and value of the testing has been questioned by a number of people concerned about the community’s exposure to toxic chemical emissions from the Exide plant. Boyle Heights resident Doelorez Mejia is one of those following the Exide issue closely, and she told EGP she does not trust the screening program. 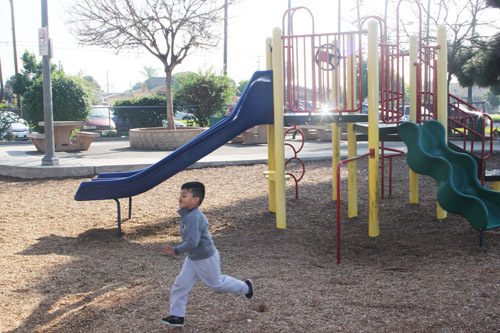 “We all know lead is in our communities, it’s in our soil,” adding that results from the blood test would only distract from the community’s efforts to prove Exide has caused health problems in residents. Exide agreed to pay for the confidential screenings administered by the County as part of their effort to remediate the fallout from the state regulators’ findings and backlash from community activists and elected officials, many who want the plant shut down permanently. According to Joseph R. Landolph Jr., Associate Professor of Molecular Microbiology, Immunology, and Pathology at USC’s Keck School of Medicine, lead only stays in the blood for 30 days before it breaks down. Although blood testing is the standard form of determining exposure the lead, it actually stays in a person’s bones for up to 20 years, Landolph said. In adults, 90 percent of lead is found in bones, he told EGP. Because it stays in the bones, pregnant women and those undergoing menopause are prone to reabsorbing the lead, he explained. “All the [test] would say is that lead is in your blood,” Landolph said. Once lead is found, the county would have to determine exposure by looking at the individuals surrounding and “assume everything is a contribution in proportion to how much they put out,” he added. 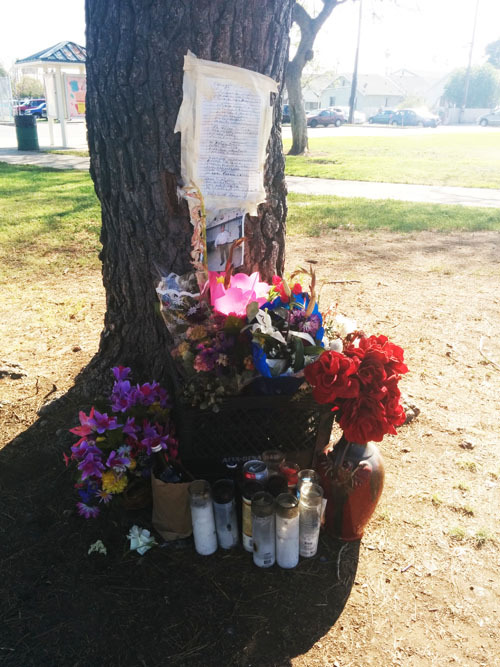 That is why Teresa Marquez of Boyle Heights did not get tested. She told EGP the test was “not worth the trouble,” especially since any alleged exposure from Exide may be gone since the plant was closed in March 2014 to make facility improvements. Exide had not responded to EGP’s request for comment as of press time. “Nobody came to us,” she said. In an email, a spokesman for the department of public health’s environmental health division told EGP the County mailed out flyers with instructions on how to get tested to the 30,000 area residents in the impacted area in April 2014 and again a couple months ago. Speaking in Spanish, she told EGP, “If I didn’t know about it and didn’t get tested” how would he get tested, she said referring to her grandson.